In Benin, the environmental organization CREDI assists local communities in protecting the Sitatunga, an endangered antilope that depends on wetlands and swamp forests. They also support women in generating sustainable income, for example by producing and selling pineapple juice. The sitatunga or marshbuck (Tragelaphus spekii) is a swamp-dwelling antelope found throughout Central Africa, centering on the Democratic Republic of the Congo, Cameroon, parts of Southern Sudan, Ghana, Botswana, Zambia, Gabon, Tanzania, Uganda and Kenya. 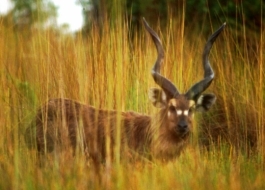 The sitatunga lives in thickly vegetated, muddy swamps, and marshes. Sitatungas are still found in small numbers in Saiwa Swamp National Park in Western Kenya as well as in larger populations around Lake Victoria, the Selous Game Reserve in Tanzania, and in several river basins in Uganda.